See the latest security solutions to prevent cyber attack. 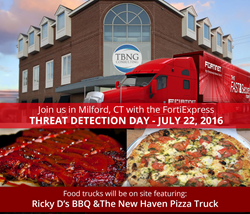 Fortinet’s FortiExpress, a cyber threat detection center on wheels, is headed to TBNG Consulting in Milford, CT on July 22nd from 1-4pm. The custom 18-wheeler offers a state-of-the-art, Threat Detection Showcase and Demo Center. Security experts will be sharing the latest research on emerging cyber security threats, as well as how to protect networks while maximizing the impact of IT infrastructure. Space is limited, so register today and see the world’s fastest firewall in action. Security Engineers will be on-site to discuss the latest advances in securing networks from cyber attack. See Fortinet’s cyber security solutions first hand with live demos of innovative solutions including: FortiDDoS; FortiSandbox; FortiGate; FortiWiFi; Ixia (Breaking Point) Perfect Storm; VMware ESXi Appliance for Virtual Appliances; FortiOS; FortiManager; FortiAnalyzer.